Some of my fondest memories as a kid growing up in northern West Virginia involve the snow and to this day I still enjoy it and need an occasional fix. I love how clean it makes the ground look and how sweet it makes the air smell when all of the pollutants are removed. Last Tuesday we awoke to the results of the ice storm, but this Tuesday, we had a nice, beautiful snow cover to look at with the official total of 4“ here at Almost Heaven South as measured by a yardstick on my deck railing. 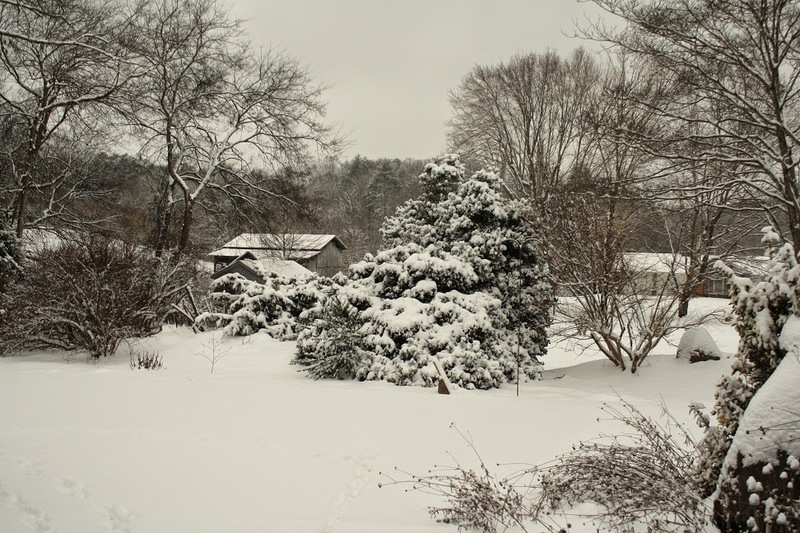 After some pretty mild weather the first part of February with six inch tall daffodil leafs, winter storm Octavia finally touched us in the worst way on Monday. As the storm moved east, it provided snow to its north, rain to its south and freezing rain in the middle – we are in the middle. In case you are not a Weather Channel watcher, the freezing rain often begins as snow at the cold, high altitude, then changes to rain as it passes through a warm layer and shows up that way here. Unfortunately, with the outside temperature in the mid 20’s the rain freezes after landing. This had several impacts for us but most importantly it glazed any untreated roads and made them totally impassable and it stuck to trees and power lines. I originally didn’t know what caused the problem, but our power went off about 10pm Monday and fortunately we got to use that generator we bought a couple of years ago – it now seems worth the money. 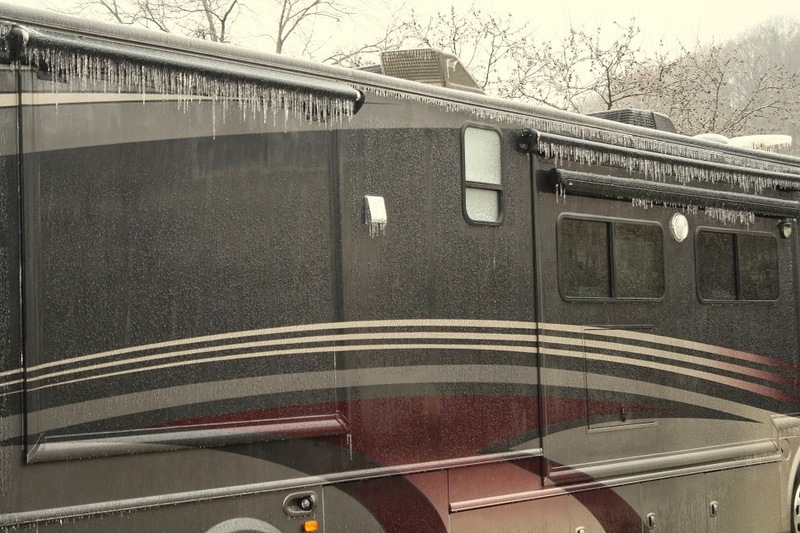 The RV is definitely angry at us for leaving Florida as the rain turned to ice all over it. While Bev was hanging out in Gatlinburg, I read the post from Catherine Mayhew for Grilled T-Bone Steaks with Crab and Hollandaise on the Char-Broil Live site and decided this would make a delicious Valentine’s Day meal. Then I remembered the whole beef fillet in our freezer and decided it would work well for this meal, so out it came for thawing and trimming. We also had a package of King Crab in the freezer to use for that part and we decided on some asparagus and a Caesar Salad to round out the meal. This is the amended recipe as we made it. Greetings fellow bloggers – We are happy to announce that the 6th rendition of our annual blogger party will be held at Almost Heaven South during Memorial Day Weekend. Chris (Nibble Me This) and I still have the final details to work out but wanted to tell you the possible dates (most likely May 24) in hopes you would pencil it in on your calendar. We would appreciate if you would mention it on your blogs as well so more people will be aware of the event. Many of you have expressed a desire to come in the past so why not make this your year – before I get too old to host them. More details will follow in March. Since it didn’t rent and to keep it from going to waste, Bev and some girl friends are spending the week at our timeshare in Gatlinburg, TN doing a little shopping, exercising, and eating out. Meanwhile I’m watching the house, the pets, and tending to Madison. When I talked with Bev one morning, before I ate breakfast, she read part of the breakfast menu from Crockett's Breakfast Camp to me and I became instantly hungry. 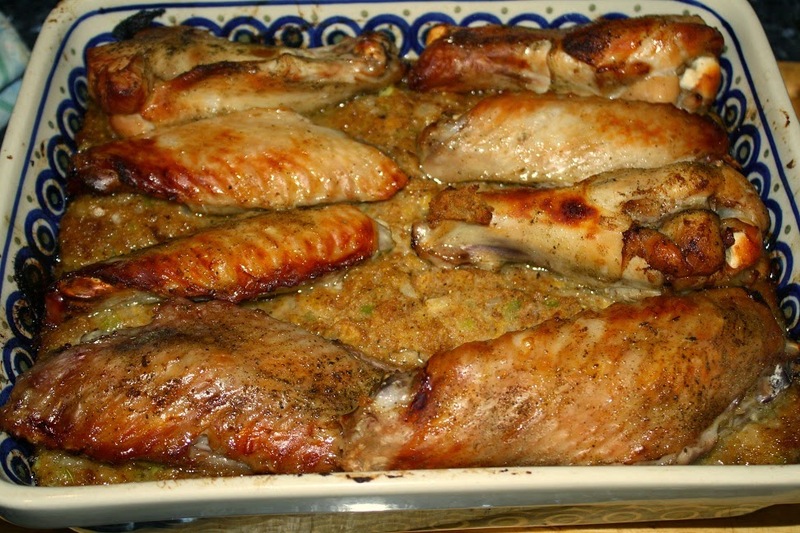 In the freezer, we had a package of turkey wings left from the holidays and we decided to bake them with stuffing for an easy meal. Notice I did not say easy week-night meal as every day is Saturday for us old retirees. After opening the package, Bev decided the three wings would not be enough and she picked up a couple more at the store the next day. I did some web searching and found several recipes for guidance and cooked them covered for a two-three hours at 250 F, then I removed them from the pan, dumped the liquid and added some uncooked dressing/stuffing mix prepared per package directions. I raised the oven temperature to 350 F and put in the stuffing to bake for 10 minutes. I then laid the turkey wing pieces (less the giant drummys) atop the stuffing and put them back into the oven until browned (about 15 minutes), then flipped them for another 15-20 minutes to brown on the other side. 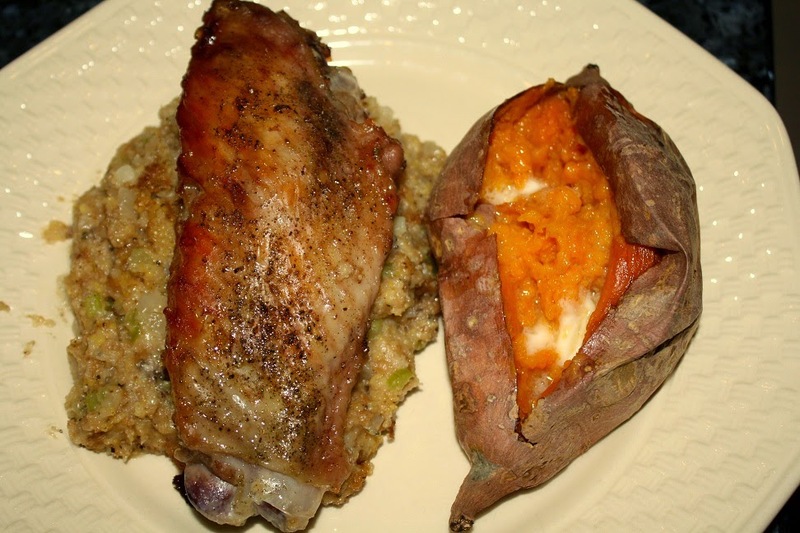 We served them with some delicious baked sweet potatoes. The meal was good, but this post is about the wings themselves. While I know chicken pieces can vary a lot in size, when we buy chicken wings, they are pretty much the same size. Even though I know turkeys can have a wide range in size, with the large ones in the store more than double the weight of the small ones, it never occurred to me that I would see this when buying wings. I was shocked when I opened the new package and declared "Holy cow, these things must have come from an ostrich." The two drumettes are on the right and the two bone pieces are on the left and I think the size difference was even more than my shot shows. They are laying on a full sized cutting board and the two bone piece is laying atop the dressing on a standard sized dinner plate. One of the large wings had nearly as much meat as the three smaller ones combined so I cooked them based on size, adding them to the covered pan in 30 minute increments. 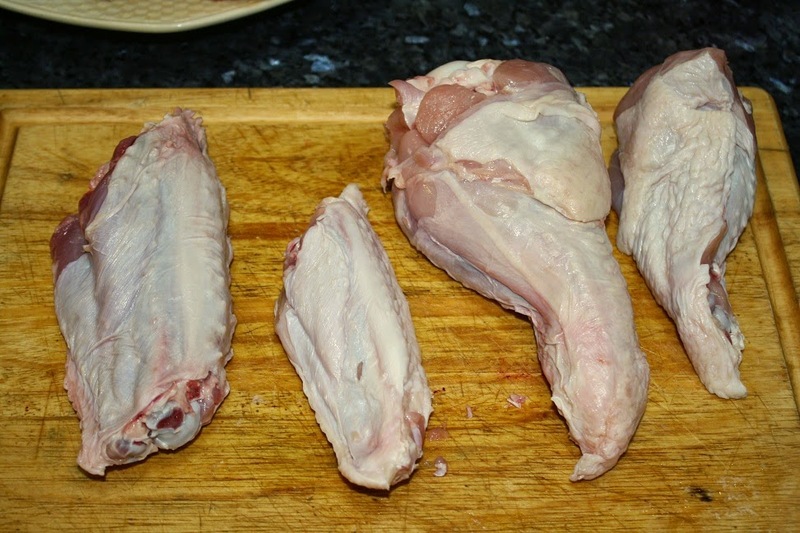 The lesson here is to be careful what you grab up at the store as all turkey wings are not created anywhere near equal.